And at least once a day, I type out a multi-paragraph answer. And honestly I don’t have that much time every day, so I’m going to answer it here and then I can just send them the link. Life insurance and SBP are very different products for very different goals. Life insurance provides a lump sum of money, and SBP provides inflation-adjusted, lifetime income. How much of each you need depends on a wide variety of factors, and most families find that they need some of each. What you shouldn’t do is make it an either-or question, because they’re not either-or products. It’s like asking whether you want a sandwich or a coffee. You might want a sandwich, and you might want coffee, or you might want both, or you might not want either one. But there’s only a small relationship between whether you want a sandwich and whether you want coffee. How old is the retiring service member? How old is the spouse? What is the health of each party? Is the retiring service member insurable? At what rates? How long a term can you get or afford? Are there kids? How old? What are the family’s assets? Liabilities? Anticipated future expenses (like college)? Does the surviving spouse work, or would he or she work if necessary? What is their potential earning power? Is the retiree planning to work? Is that work dangerous and/or likely to be excluded from commercial policies? What other stream of income can be anticipated at which points in the future? Which choice will help you sleep better at night? Is the surviving spouse prepared to and confident about making a lump sum of money last a lifetime? Do they understand investments? Would the surviving spouse be good at fending off helpful financial advisors and well-meaning (or not-so-well-meaning) friends and family members who know of their lump sum of money? Will the spouse continue to be able to do this as he or she gets older and perhaps has some cognitive decline? How will you protect a lump sum from lawsuits, divorce, or being sucked up by medical costs if someone becomes disabled? Obviously, SBP and life insurance each have their own pros and cons. Understanding each product is vital to making a good decision. These charts highlight the major considerations, but please be sure you understand each one thoroughly before making a decision. There are many different ways to figure out the “best” choice for your situation. You need to evaluate your needs, and what current assets and income streams can fill those needs. Then you pick the right tool to fulfill remaining needs. Then let’s take a different couple, Steve and Sue Sailor. Steve is retiring from the Navy, and Sue works as an economist for a think tank in DC. Both their kids are out of college and they rent a condo, with no desire to buy. Sue’s income is enough to carry the rent comfortably on her own, and she would continue working if widowed. Sue has her own 401(k) account with $400,000 in it, and she contributes to it each year. Steve and Sue don’t have any lump sum needs requiring life insurance, and Sue doesn’t need Steve’s income to maintain her lifestyle, so SBP is unnecessary for them. Obviously, these two examples are towards the ends of the spectrum. Most people fall somewhere in between, and that’s where it gets trickier. Let’s try a third example, Amy and Adam Army. Amy is retiring. Adam has worked at some duty stations, and he’s pretty good at his job, but he doesn’t have a full resume to attract a high-paying job quickly. Amy has $150,000 in her TSP, and Adam has been funding an IRA every year and has a $150,000 balance in it. They have three kids, two in high school and one in college. They have a mortgage and a car loan. How do they decide on the right choice for them? They might consider a smaller term policy, to pay for the kids college, and partial SBP to supplement Adam’s income and retirement. I can’t emphasize enough that there are no right answers to these questions, just the right answers for your situation. And absolutely don’t underestimate the “sleep at night” factor – what coverage will give both spouses the peace of mind to enjoy retirement together without worry? Do not use just this post to make your decision. 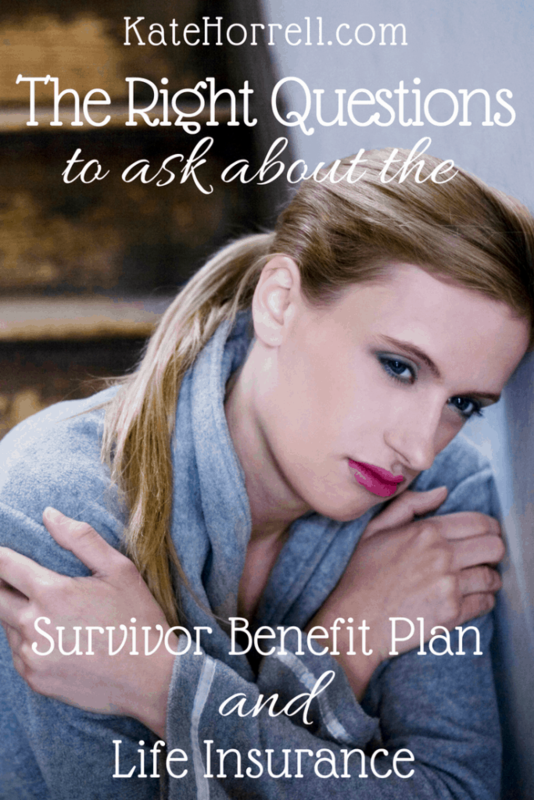 There are many resources to learn about SBP, and you can learn about them all here: 10+ Places To Learn About The Survivor Benefit Plan. I am a friend of a widow of a retired service member who died of a service connected disability. At the time of retirement he elected to NOT accept SBP. He died within one year. He overdosed in their bathroom. I want to know if she can fight this? He made a poor decision for her and his children. He wasn’t well enough to make this decision. Yet, the military allowed him to make this decision. Is there anything she can do? Is there ever an instance/ reason she can receive this benefit they both invested in for 20+ years?